We’ve written in previous Gift Giving Guides about giving children experiences, consumables, and “coupons” for spending time together. We still think these are all terrific ideas — especially experiences that include museum or zoo passes, music or dance lessons, and vacations. But, there are also practical gifts for kids that they can unwrap, which help to keep their lives more organized. A Cocoon Grid-It Organizer paired with a stylish pencil case and some high-quality Palomino Blackwing pencils. Teenagers can learn a great deal from professional organizer Julie Morgenstern in Organizing from the Inside Out for Teenagers. 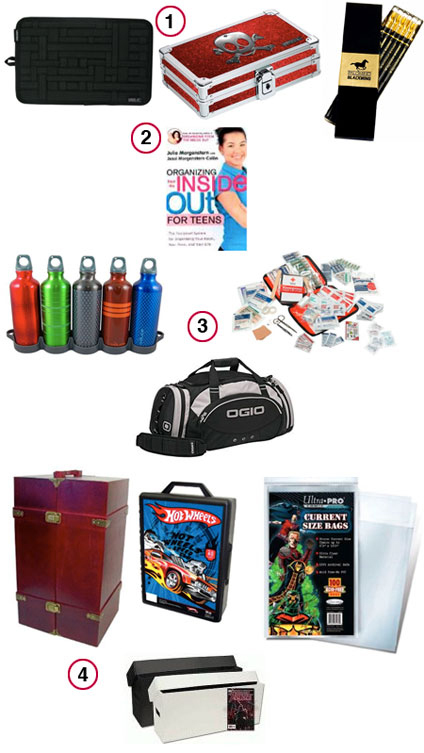 An athletic child could use reusable water bottles, a first aid kit, an Ace Bandage, and a durable duffle bag. Lovers of the American Girl dolls might like a Doll Storage Trunk. Hot Wheels enthusiasts could appreciate a Car Storage Case. And, comic book readers might like Comic Storage Bags and a Comic Storage Box. Check out all of the ideas in our 2010 Holiday Gift Giving Guide. Clutter isn’t always a result of owning too many things or being too busy, it is often caused by bad processes. For example, is your purse or wallet overflowing with receipts? Receipt clutter is almost always caused by either not having a process for handling receipts or having a process you don’t use because the method is inconvenient, poorly designed, or not the best process for your needs. Your purse or wallet is stuffed to the brim with tiny strips of paper because you don’t have an effective process in place to deal with receipts. Receipt clutter isn’t the only problem caused by bad processes — you might have an issue with an overflowing e-mail inbox or suitcases lingering full of dirty clothes for a week after a vacation or shoes constantly in the middle of your living room floor. Do any of these issues strike a chord with you? If not these, maybe you can identify some area of your life where clutter appears because of a bad process? Identify the clutter. This seems obvious, but can be more challenging to do than you might assume. After looking at clutter for awhile, clutter has a way of becoming invisible. So, take a picture or ask a friend to come over to help you really see the clutter. Figure out where you want the object to live in your home or office. Do you want dirty clothes to live in the clothes hamper? Do you want shoes to live in the front closet? Do you want receipts to live in the trash or filing cabinet? Determine a way for the object to consistently reach that storage space. Now is not the time to think you have super powers — be realistic with yourself about your energy levels and commitment to maintaining the process. Mentally map out a plan for how you will process the object so it stops cluttering up your space. Acquire any materials you might need for the process. In my case, I have to put a plastic zip top bag in my purse to hold all of my receipts for a month. Additionally, I have to carry a purse that is large enough to hold the zip top bag full of receipts. Use your newly created process. Evaluate your process. After a few weeks of learning and adapting to your system, take the time to review its effectiveness. If you realize your system was too complicated and difficult to maintain, determine where in the process your system is breaking down and change that attribute. Maybe the object needs to be stored in a more convenient location, maybe the steps involved are too cumbersome, or maybe you don’t have the right tools for the job? Communicate. Find out exactly when your clients, vendors, bosses, and co-workers will be available and in their respective offices. Mark this information on your calendar, and remember that many people mentally check out the day before they leave on vacation. Manage expectations. Let everyone you’re responsible to know when you will be in the office. Additionally, regularly update people of your work progress so they can better manage their time. If you fall behind on a project, let people expecting work from you know as quickly as possible. Set small deadlines. Now is not the time of year to take on the Next Big Thing. As much as you can manage, set small, achievable deadlines and save the larger projects for the spring. Set realistic deadlines. Double or triple your expected work times. If it usually takes you three hours to write a weekly report, give yourself six hours — especially if other people are involved in reviewing your work. Tackle your mindless work. Let’s be honest, your motivation tanks in December, too. Instead of goofing off and getting nothing done, actually finish the mindless responsibilities on your to-do list (filing, returning phone calls, filing out forms). What tips and tricks do you employ in December to stay productive? Share your advice in the comments. When my son joined our family, a friend gave us a gift card to our local grocery store. This was an amazing gift because it freed up some cash in our grocery budget that we could then use on much-needed baby supplies. I was thinking about this grocery store gift card when creating our shopping list for the upcoming holiday season. A good number of people on our list will be receiving gift cards for things they usually buy, so they can free up some money in their personal accounts for other things they want. Random gift cards to places they don’t typically frequent could be a bad idea, but if you know the exact places your friends and family go, you can help them out this year. This list is obviously not inclusive of every possibility, so please provide even more ideas in the comments. If you have small consumer electronics cluttering up a drawer or cupboard in your home, you can send it off to be recycled at no charge through the USPS. On my side of our family, we don’t celebrate the holidays the way other people do. We usually end up buying presents for each other when needs arise, instead of waiting for the calendar to turn a specific date. For example, when my mother’s computer bit the dust this summer, we celebrated Christmas in July by chipping in part of the purchase price for her to get a new laptop then. When the holiday catches up on the calendar, she’ll have an additional stocking stuffer gift to open, and will have been enjoying the big gift she really wanted for six extra months. This doesn’t work extremely well with children, especially younger children who don’t yet have a full understanding of time. However, young children aren’t usually quiet about the things they want. Whether they’re writing letters to Santa Claus or screaming it at the top of their lungs, it’s not much of a secret. It’s easy to buy kids one or two things they want since you know exactly what those items are. Figuring out what adults want, though, might be more complicated. So, I recommend doing what we do in our family and simply ask the person what they want or need. You may not choose to do this for everyone — surprises can be fun — but if you’re buying a large gift, it’s nice to get someone what they want or need. On my husband’s side of the family, everyone keeps an Amazon Wish List. We’ve all installed the Universal Wish List Button, so we can include items on the Wish Lists from any online retailer, including individual sellers like those on Etsy. These lists are especially helpful when buying for the younger cousins who were into video games last year, but are all about football this year. There aren’t any questions about sizes or team preferences or if the gift will be appreciated. No one expects you to buy from their list, but it’s a great resource for ideas when you’re the gift giver. As part of the Practical Presents theme of this year’s Gift Giving Guide, we believe buying people what they want or need meets every definition of practicality. In our 2008 Gift Giving Guide, we recommended Amazon’s Kindle as the ultimate holiday gift. Today, Amazon will be selling some remaining inventory of their previous generation Kindle for only $89 as part of their Black Friday promotion. While these units may lack some features found on the most current model, they are still excellent e-readers, especially at the $89 price-point. This promotion will begin at 12:00 pm EST (noon). To take advantage of the deal, you’ll need to visit the Black Friday sale page on the Amazon website. These are likely to be in short supply and will probably run out quickly, so you’ll want to be ready to take advantage of the promotion as soon as it becomes available. Electronic book readers are a fantastic way to reduce the number of books in a home and e-books are almost always less expensive than printed books — you can unclutter your bookshelves and save some cash. UPDATE: As of 1:00 pm EST, it looks like the promotion has completely sold out. For high school graduation, my uncle bought me an emergency kit for my car. At the time, I thought it was the most boring gift ever. I tossed the kit in the trunk of my car, wrote my uncle a generic thank-you note, and quickly forgot about the kit. I lit a flare, put up a “Driver in Distress” orange sign, wrapped myself in the silver blanket, and crawled back into the car to wait for someone to drive down the quiet country road. While I waited, I snacked on the granola bar that was also in the pack, and did some word searches from a game book my uncle had put inside the kit. Two hours later, an elderly woman drove by and said she’d call a tow truck for me when she got home. Half an hour after that, the tow truck driver and I were on our way to the mechanic’s shop down the street from my dorm. The emergency kit from my uncle turned out to be an amazing gift, one that I didn’t appreciate until I desperately needed it. AAA’s Road Assistance Kit, a practical gift for anyone who has a car and doesn’t already have a kit like this. 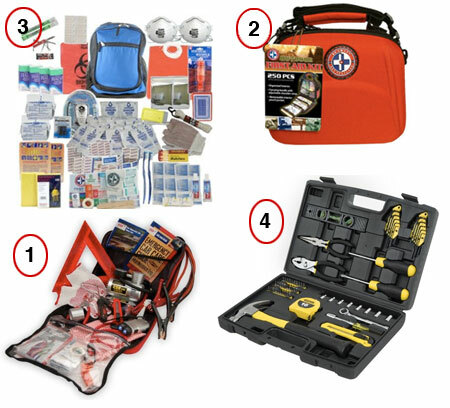 Total Resources’ Emergency Medical Kit is nice for the home, office, boat, RV, and on a camping trip. The convenient carrying case makes transporting it with you extremely simple. SurvivalKit’s Disaster Emergency Kit is perfect for someone who lives in an area prone to natural disasters. For someone moving into his or her first place, a Stanley Tool Kit is a good starter tool kit. The carrying case also makes these items easy to store in an organized way. A bike enthusiast in your life might enjoy a Bicycle repair kit in a nice travel bag. These kits can be strapped to the bike so they’re available when they’re needed. These specific kits might not work for someone on your list, but you can build one tailored to your recipients’ specific needs. If you do, aim for practical and utilitarian items, and be sure to include a storage case so all of the kit items can be stored together. 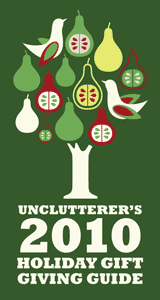 Check out our complete listing of items in Unclutterer’s 2010 Holiday Gift Giving Guide. Find out how Kathy Spencer feeds her family of six on just $4 a week. Jack Black All Over Wash, a 3-in-1 cleanser for face, hair and body in a convenient pump. 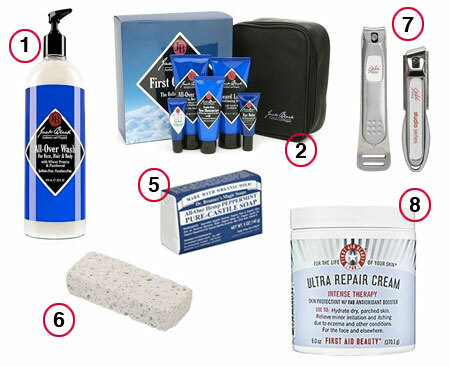 Jack Black Travel Set, grooming products all in 3 oz. bottles or smaller to easily make it through airport security. Merkur “Futur” Adjustable Safety Razor, so he can stop using those disposable razors. Merkur Double Edge Razor Blades, 30 blades to go with the razor. Dr. Bronner’s Peppermint Soap, six bars for less than $20. Earth Therapeutics Pumice Stone, so he can treat his feet. Seki Stainless Steel Fingernail and Toenail Clippers. If his feet are in bad shape, the Seki In-Grown Toenail Clipper could work, too. First Aid Beauty Ultra Repair Cream Lotion, it’s not greasy, doesn’t have a fragrance, and is the only lotion my husband will touch. Over drinks the other night, my friend looked over both of her shoulders, giggled nervously, and then very quietly confessed to me that she doesn’t read fiction. I patted my friend on the shoulder, told her it would be okay, and then shared with her one of my favorite new sites for discovering non-fiction works. Every day an eminent writer, thinker, commentator, politician, academic chooses five books on their specialist subject. From Einstein to Keynes, Iraq to the Andes, Communism to Empire. If you’re interested in learning all about Norwegian crime writing or the Euro or Confucius or gender politics or bats, experts on these topics provide lists of the quintessential books you should read to learn a good amount on the topic. It’s convenient to have a reading list built for you by someone who is intimately familiar with the topic. Whenever I’m interested in learning something new, I pull up the site’s archives, find a topic, and start reading. I’m currently working my way through Paul Barrett’s list of dinosaur books because of my son’s infatuation with these creatures. I haven’t been asked by Five Books to create a list of organizing or uncluttering titles, but I have thought about it a little. Obviously, I’d put my book Unclutter Your Life in One Week on the list. Also on the list would have to be David Allen’s Getting Things Done. Martha Stewart’s Homekeeping Handbook and Randy Frost and Gail Steketee’s Stuff would likely make the list, too. I’m torn about what my fifth book would be, though. Would I choose a corporate management book like The Toyota Way or a classic home-organizing book like Peter Walsh’s It’s All Too Much or would I go on more of a philosophical bent with a book like The Plain Reader? Thankfully, I don’t have to make a decision about what books I would put on my list, but I’m glad the experts on Five Books are able to narrow down theirs. The site is an incredibly convenient way to become knowledgeable on a subject without cluttering up your time.